Barely a month goes by without some sort of festival or carnival, usually involving a procession through the narrow streets of the old quarter. The principal annual events are listed below. An interesting festival mainly in honour of animals, widely celebrated in Italy on 17 January. Early in the morning, a huge bonfire of olive branches is lit in front of the Chiesa di Sant’Antonio. During the day, every person in Capena lights a cigarette from the fire. The use of tobacco is recent – formerly rosemary was smoked in clay or reed pipes. Some academics have sought parallels with the ancient pagan rite of throwing fragrant herbs on fires during sacrifices. The amazing thing about this festival is the fact you can see even the tiniest children puffing away on cigarettes throughout the day. This aspect of the festival has prompted inter­na­tional interest and disap­proval. The night before the festival, the children go from door to door carrying improvised collection boxes bearing religious images and singing nursery rhymes in the hope of earning a few cents. A procession takes place through the streets of the village in the morning, with the saint preceded by horses and followed by every imaginable kind of domestic animal and pet. This culminates with the parish priest climbing the steps of the church to bless the bonfire and the animals. The tradi­tional sweet eaten to celebrate the festival is a ring-​​shaped sweet loaf flavoured with aniseed or rolls. The Good Friday procession is another local event well worth seeing. It takes the form of a simple, compelling restaging of events (something similar may be seen in many of the surrounding villages), involving costumed characters and the symbols of the Passion carried on silver plates in a procession. During the Easter festivities, it is tradi­tional to eat a local delicacy known as pizza ricresciuta: a very tall egg-​​based sweet that requires long, laborious preparation. On Easter morning, all the families breakfast on this “pizza”, accom­panied by salame and hard-​​boiled eggs. Celebrated on 25 April, the day on which the children in Capena tradi­tionally receive their First Communion. At the end of the religious ceremony, a procession takes place with the statue of the saint preceded by the children taking their first communion. This leaves the parish church and ends up at the little church dedicated to San Marco some distance from the village. The priest blesses the fields in the sacristy of the chapel, and also some special sweets made for the occasion known as lepericchio and sposatella. The sweets are made in a special shape: the lepericchio is for men and is round with an egg at the bottom: the sposatella, made for the women, is in the form of a young girl with her hands on her hips, wearing a dress decorated with sugared almonds and two peppercorns for her eyes. Both sweets are decorated with pretty satin ribbons and carried in the procession by all the inhab­itants of the village. This is the village’s main festival and is celebrated on a night between 13 and 15 August. It involves two famous icons of Our Lady of the Assumption (the Virgin Mary) and Jesus mounted on two very heavy plinths. The origins of the tradition are very ancient. Some historians believe it dates back to the Triumphs celebrated in honour of the Roman emperors, which were later incor­porated into the Christian religion to become the Triumph of Jesus the Saviour and Our Lady of the Assumption. Under Pope Adeodatus (672–6), it was decided that the Festival of the Assumption should take place in Rome during the night between 14 and 15 August. The tradition then spread throughout Lazio, where it has continued to this day with very few interruptions. The procession held in Capena varies slightly since it is based on the popular belief that the Madonna has lost her Son and searches for him desperately for three days. When she finally finds him, she runs to meet him. 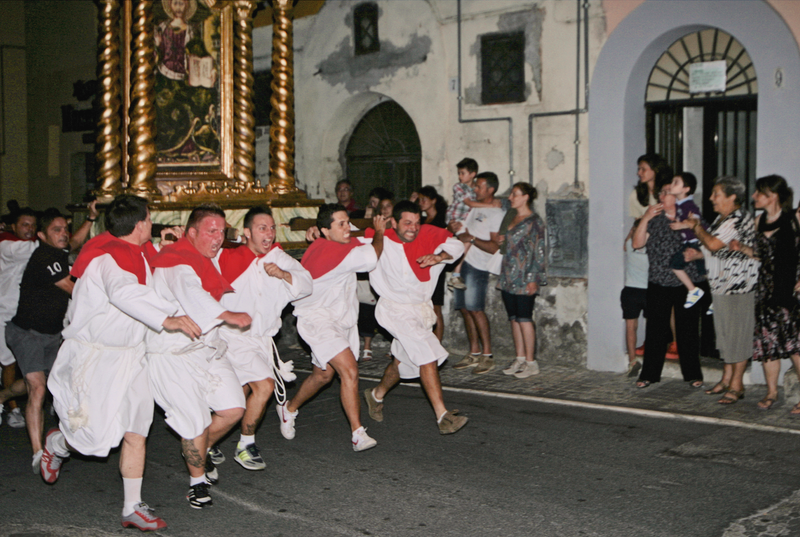 Very late on the night of 13 August, eight men carry the baldachin or canopy bearing the icon of Jesus from the chiesetta down through the village to the entrance of the former Monastery of the Monks of San Paolo and leave it to stand there throughout the night and the following day. On 14 August, the icon is visited by the faithful from Capena and surrounding villages, who come to pray to the Saviour. On the night of 14 August, amid a charged atmosphere of expectation with the streets lined with people, two processions set out from opposite ends of the village, one bearing the baldachin with the very fine effigy of Our Lady, the other bearing the baldachin with the icon of Jesus. At the moment when the two processions catch sight of one another, the bearers (who are members of a special Broth­erhood and wear special white robes with cloaks – blue for those carrying Mary and red for those carrying Jesus, as shown in the picture above) sprint as fast as they can toward one another: no mean feat given the weight of the icons. They converge in the very centre of the village, to great rejoicing, embraces, fireworks and even a few tears from the older residents. The icons are then escorted in procession back to the ancient chiesetta. On the following day, the two images are borne back to Piazza del Popolo, where the priest blesses the icons and everyone in the village. As part of this ceremony, one family in the village is given a small bronze statue of the Virgin Mary to keep for one year. The family keeps it devoutly in their home until the next 14 August, when they give it back to the parish priest, together with a donation to the church. On 29 September, the festival of San Michele is held at the turn-​​off (or bivio) to Capena on the Via Tiberina. This farming festival confirms that this area, together with the nearby Lucus Feroniae site, has been an important trading post occupying a strategic position on trade routes since ancient times. This festival still attracts numerous visitors, many of whom come to buy and sell livestock. This important festival is held on the first Sunday in October each year. It was introduced in 1927 to celebrate the grape harvest (vendemmia). The village is festooned with laurel garlands and bunches of grapes to mark the occasion and wine pours out of mouth of the marble lion’s head on the steps of the church of Sant’Antonio. The festival culminates with a procession of floats pulled by tractors and oxen, carrying girls in tradi­tional dress handing out grapes. The procession ends in a grape fight, the drinking of wine and general carousing. The end of the festival is marked with a firework display. The festival of the village’s patron saint is held on 18 October and is marked by yet another procession through the streets. As with the summer festival, a statue of the saint is given to a family in the village for safe-​​keeping for one year. Tasty maritozzi col mosto are made to mark the occasion: the festival takes place not long after the grape harvest and the fermented must is used as an ingredient in these sweets.